Kanul (right) and Muthu showing the map which shows the affected areas. KOTA KINABALU: The alleged extraction of stones and sand from the Kadamaian River may have caused the death of a huge number of mangrove trees in the vicinity of the area. Kota Belud social activist Kanul Gindol said that there were a few villages being affected by this issue, namely, Kampung Pompod, Pengkalan Abai, Kuala Abai, Suang Punggur and Lentigi. “This involves mangrove trees in an area that is very spacious, approximately more than 500 hectares or 1,000 hectares. A big portion of the area is filled with wetlands, which is under the Forest Reserve. “…the mangrove trees which have died, belonged to individual titles (which cover a smaller portion of the whole area),” added Kanul. He explained that a smaller portion of the said area are owned by individual titles and the mangrove trees in that small portion are ‘dead and dying’. Kanul further claimed that he had been noticing this for a few months since he lives near the area. He added that if you look at the trees closely, you will notice that they are grey and white in colour and are brittle. Based on the interviews that Kanul had conducted in Kota Belud, he found out that there could be two main reasons why the mangrove trees had died. Firstly, he took note of the earthquake that had struck Sabah back in 2015. As a result, Kadamaian River was one of the rivers that were significantly affected. The earthquake had triggered mudflows, which mainly affected Kadamaian River. Kanul disclosed that even before the earthquake, there were already quarry companies upstream, about four or five kilometres from Kadamaian River which had been extracting stones and sand that triggered this problem. “This has been done for many years. There are not two or three of them but instead there are many of them. Each year, the number of machines and lorries increases. “This occurs everyday, from morning until evening. 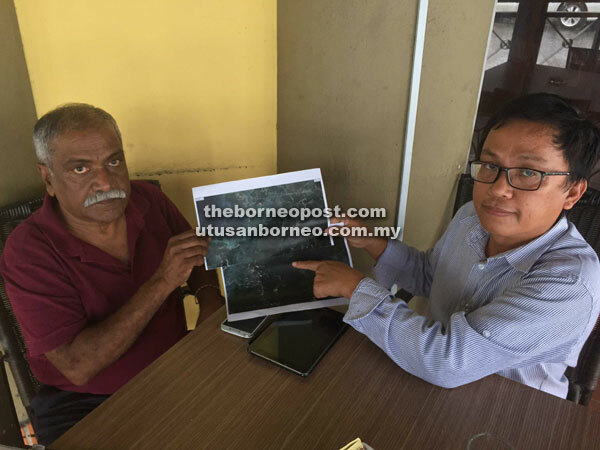 Up to a point where many spots along the Kadamaian River … up to the town in Kota Belud (another eight or ten kilometres) were affected and it is still going on today,” he added. Thus, to put in context, the two reasons, which caused the mangrove trees to die are the mudflows and the extraction of stones and sand. He said that since the extraction had been occurring for many years, the water flow, canyon and rocks of the river were also severely affected. “This is what I have found out as a layman. Now, I am calling on people with expertise … people like SEPA environmentalists, scientists, the Environment Protection Department, university/college representatives and maybe even the Federal Department of Geological Minerals to immediately dispatch their team to go there and study. “They can work with the Forest Department since this is a Forest Reserve to establish the cause and if it is still in time, take quick remedial action … so the trees that are still alive will not be affected. “Secondly, I, as a concerned citizen and a Kota Belud activist, would like to call on the relevant authorities, including MACC (Malaysian Anti-Corruption Commission), to also carry out investigations as there are allegations and reports that I have received verbally from Kota Belud that these extractions of stones and sand might have gone beyond what is allowed of them. “This means that we have an enforcement problem in Kota Belud as far as this uncontrollable extraction of stones in Kadamaian River is concerned,” Kanul said in expressing his concerns for Kota Belud. However, Kanul admits that these are serious allegations and thus he hopes that the relevant authorities will investigate further on this. “It is strange, that such an environmental problem of such magnitude has escaped the eyes of those people in position. “So now I am coming out because I want these mangrove trees to continue existing because it is important for the ecosystem in the area,” said Kanul. He went on to stress the severity of the mangrove trees, whereby he said that was visible even from the roadside and that most of the leaves were dead. “Just because nobody actually dies from this issue, it does not change the fact that it is still a very serious issue. “If this can happen at my Kota Belud, it can surely happen anywhere in Sabah. Who is at fault? It is the human beings and not the trees themselves,” he said. Kanul, who is also the chief facilitator for My Malaysia-IK, spoke to the media during an exclusive press conference at the Kinabalu Club Lido yesterday. Also present was SEPA Life Member SM Muthu who is an environmentalist. Muthu expressed his gratitude and support towards Kanul for his efforts in preserving the environment of Kota Belud. “I am interested and I am also worried about this issue but I am grateful for Kanul’s efforts. More people like him should come forward,” he said.